This historical background information has been published following our 20th anniversary commemorative running over old route 73 with RM 29 a few days ago (which was part of the ADMS Watford Running Day on the 31st March). 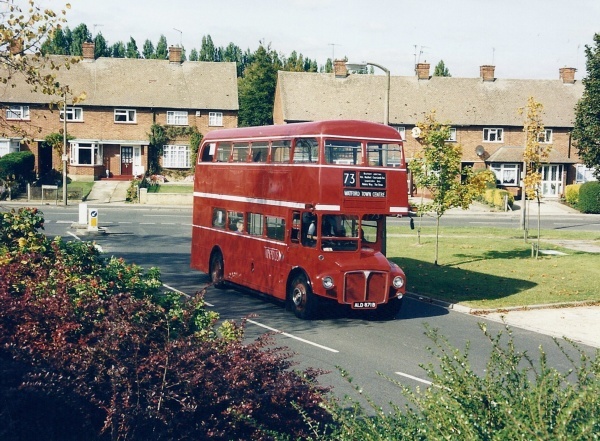 During the mid 1990s, we operated some local bus services in the Watford, St Albans, Hemel Hempstead and Abbots Langley areas of Hertfordshire with Open Platform Routemasters (on Sundays we used our Regal Four or first Routemaster Express - RMA 37). During this time we were based in the villages of Park Street, then Colney Street, and finally Hartspring (Watford). Service 73 starts. Saturdays only, hourly. Watford Town Centre (WTC) - Leavesden - Woodside with hail and ride around Boundary Way. Crew operated (driver and conductor). Operating hours 0830-1800 hours. Using one Routemaster RM 2180, painted with a grey and red interior colour scheme. RLH 23 can be used occasionally if needed. Monday to Friday service introduced, hourly. Saturday service now half hourly. RM 2156 joins the fleet, to make a pool of two. Most trips now omit Boundary Way; 4 trips a day continue to go around it. LDT/the Shires service 373 starts in competition. Service 73 more frequent (2 per hour) during Monday to Friday peaks. Introduced service 74 (hourly) WTC - Abbots Langley (High Street), taking a more direct route through North Watford which misses out Haines Way and Woodside. Introduced Sunday service 73 using one person operated RF 491, hourly. Two service 73s per hour all day Monday-Saturday. Extra service 73s in Monday-Friday peaks. Service 74 remains hourly but is extended from Abbots Langley High St to South Way. RM 1571 and RM 2198 used from around this time. Minor timetable changes, including finishing a little later. RM 1394 and RM 1871 acquired. One hour later finish on service 73 on Thursdays, for late shop opening. Introduced service 72 to St Albans on market days (Wednesdays & Sats), one person operated. Service 74, and every other 73, are extended via Bedmond to Hemel Hempstead. Within Hemel, the 73 travels via Adeyfield, the 74 via Bennetts End. Because of the Hemel extension, service 74 runs the other way through Abbots Langley, serving South Way first, followed by the High Street. Sunday service 74 to Hemel introduced (hourly). 2 buses in use in total, RMA 37 and RF 491. Positioning journeys to and from Colney Street depot are registered as service 21. Watford & District Motor Services (WDMS) take over service 73, and introduce service 77 to Rickmansworth, and service 21 to Holywell estate. Services 74+72 withdrawn. WDMS abruptly cease all services.